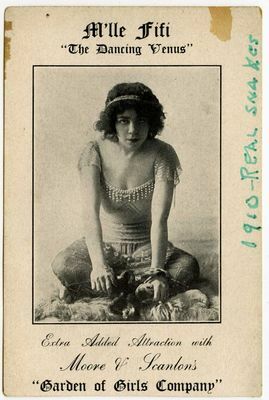 A black and white postcard image from the papers of Mary E. Dawson, a dancer born in Philadelphia who became known in the entertainment world as Mademoiselle Fifi. She performed some of her first dancing routines in Old Town, Maine, in 1905. Although clippings in the collection indicate that many details were changed, Dawson's life was the inspiration for a 1960 novel by Rowland Barber titled The Night they Raided Minsky's, a work adapted into a film in 1968. Text on the postcard reads, "M'lle Fifi 'The Dancing Venus,' Extra Added Attraction with Moore & Scanton's 'Garden of Girls Company." A handwritten note says, "1910 - real snakes."